Not quite. However, we are able to boast a handful of "water spas" that are as close as you're going to get here to the soothing baths of Beppu. Mushy Pony, a blog about Toronto trendsetting, posted this article the year before last about where to find water spas in the city. Of the places mentioned by the Cowgirls, I've only been to Body Blitz, but I'd highly, highly recommend it if you find yourself missing the real thing. (Perhaps I'll do a full-length review the next time I visit, if readers are interested!) This is an Asian-style womens-only spa downtown where bathing suits are optional - pretty much as close are you'll get around here to Japanese-style bathing. Located in an unassuming old warehouse on Adelaide West, Body Blitz has three main pools and two sauna areas, including a sea salt bath, green tea bath, cold bath, and saunas of both the traditional and steam variety. Personalized spa services are, of course, available. They will be opening a brand new location on King Street East in August 2012. While I haven't been their Collingwood location, the Scandinave chain of spas also gets a thumbs up - I visited their Montreal location in May and was completely blown away. The experience reminded me a lot of Spa World on a much much smaller scale, and while they only offered two pools (one hot, one cold) the atmosphere was very enjoyable. When next I visit Montreal, I will definitely go back, and should you have the opportunity to visit other locations, they even have rotenburo - outdoor baths! 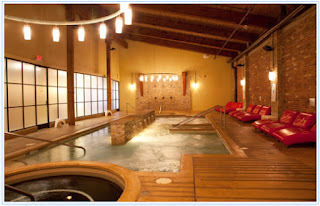 Found a gem of a water spa, in Toronto or elsewhere? Share it in the comments!